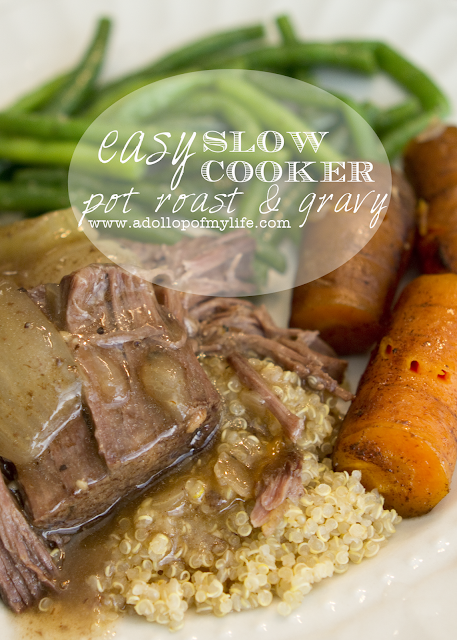 One of my very favorite slow cooker recipes of all time is pot roast. You just can't beat it as a great fall meal, and now that we're in the thick of our fall schedule, it's one of my weekly go-to meals. I figured I'd share how I cook our roast, since I'm sure I have readers who are looking for a way to make dinner time just a bit easier. A hefty roast. Since we get a 1/2 beef every year, I just pull one of my roasts out of the freezer. For this meal, I used an arm roast, but my favorite cut is definitely a rump or chuck roast. I generally use about 3lbs of meat for this recipe. 2 stalks celery, chopped. I don't really bother worrying about the size of the celery pieces. If you have picky eaters who don't like seeing greens in their roast, I'd cut it up small. 6-8 large carrots, cut into fourths. I just wash the carrots and don't bother peeling them. This helps retain a little more nutrients. You can also use baby carrots. Cut one medium sized yellow onion into eighths. Add 3 cloves of garlic, peeled and smashed. Toss the roast and all of the veggies into the slow cooker. Sprinkle an entire packet of onion soup mix over the meat and veggies. I also sprinkle just a bit of McCormicks Montreal Steak Seasoning. Probably not more than two teaspoons. Next I mix 2 cups of boiling water with about 2 Tablespoons of Beef Base. Pour the mixture over the meat and veggies. Add an additional cup of water. Your liquid should come close to covering all the ingredients in your slow cooker. 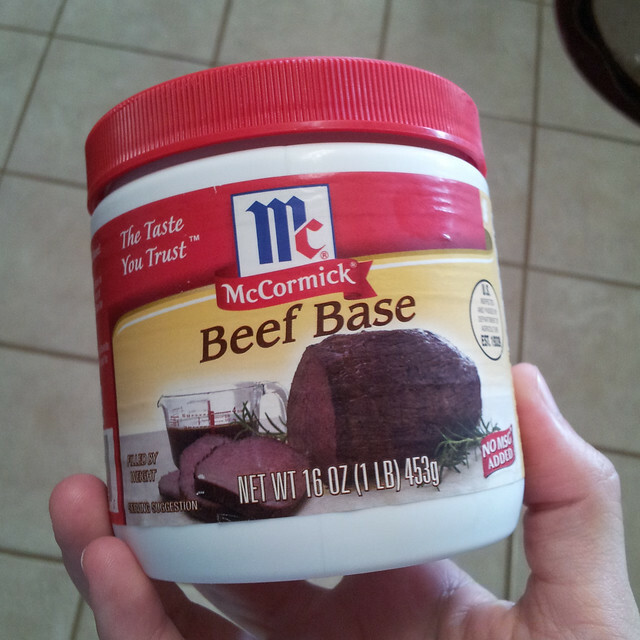 In case you're wondering what beef base is, this is what I use (I purchase this at Sam's Club). Set your cooker on low and cook for 6-8 hours (or until your roast shreds easily with a fork). After the roast is cooked, take 2 cups of the broth from the slow cooker and add to a small sauce pan. Add 1 Tablespoon salted butter and 1/8 teaspoon coarsely ground black pepper. In a small coffee mug or bowl, combine a few tablespoons of the broth with 6 teaspoons of cornstarch, and mix together until the cornstarch is completely dissolved. Add the broth/cornstarch mixture to the broth in the saucepan and bring to a boil. Stir until thickened. Serve the roast & gravy over rice or quinoa with a side of green veggies for a complete meal! Enjoy!